CherrySue, Doin' the Do: Eight Hour Cream Jewel Collection & Giveaway! Eight Hour Cream Jewel Collection & Giveaway! 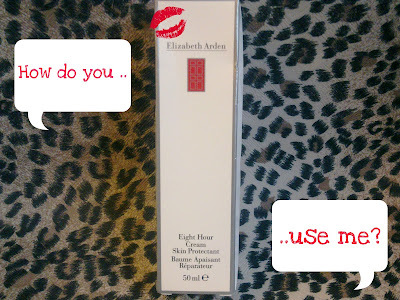 Beauty fans the world over instantly recognise Elizabeth Arden's 8 Hour Cream, not only by name and distinctive smell but by the outstanding results it can give across a wide range of beauty needs. This Autumn the range has been given a limited edition makeover and has been released as the Jewel Collection. There are 3 ways to get your 8 Hour fix in this beautiful ruby red and jewel embellished packaging. Eight Hour Cream Skin Protectant €24, the Eight Hour Cream Lip Protectant Stick SPF 15 €22 and Eight Hour Cream Intensive Moisturizing Hand Treatment €14. While these look great as pressies here at casa Cherry I've just gotten my mitts on two 50ml tubes of the original 8 Hour Cream Skin Protectant. It's well established that I ain't no hog right? Eh, that's the cream talking, not me, roigh? Giveaway Closed Lovely Ladies - watch out for a Benefit one at 200 Followers!! 2. You gots to tell me your uses for this cream, there's so many to choose from so this is easy peasy! 3. Third entry? You gotta give my Facebook page a big blue thumb up! You can find me here or by using the ickle box on the right. Please leave a comment on this post to tell me how many entries you are entitled to and include your email address/your uses/ FB ID & GFC name. Winner will be drawn by random.org to keep things fair. If you are under 18 and wanting this for your Mummy (you sly dogs) please get your parent or guardian's permission to enter. This competition is open to the UK & Éire and will run until the 18th of October. 1 week y'all. Uses= lips, nails, rough elbows, love it!!! I want the talking box. I would use it on my hands, forever getting paper cuts. entitled to 4 entries, I think! I would use this on my cuticles! A little goes a very long way so I have at least a dozen uses for it. I use it to tame my eyebrows, for chapped lips, to smooth down frizzy ends of my hair. I also use it to highlight my cheek bones. I could go on and on. It's the best thing since sliced bread! I'd use it on my elbows, without this cream they are positively pre-historic - T.Rex has nothing on my winter elbows for dry scaley skin! Elbows and lips. I have a terrible habit of chewing my lips. Must stop! This stuff works miracles. If you have dry skin put a good layer on your face once or twice a week and leave overnight. It'll be babysoft the next day and really refreshed. Love the smell of it too! My skin gets super dry, especially in the winter so I would have so many different uses for this! I guess my hands and face would be where I would use it the most. Oh I just love this cream! It has two top uses IMO. -Getting your lips through the winter chap free! In fact it is so good at the latter that my brother robbed mine last Winter. This is a guy who wont even use after shave balm but he was quite happy to use a whole pot of this stuff! tweeted, liked etc.. some entries anyway.. GOOD LUCK TO ME!! I use it for between my eyebrows... t-zone! That's what you call it! Yep when I get a really dry t-zone I use this and it helps immensely! I follow here as Sarah/Saloule, either or! I use it on my elbows, heels, lips and for those occasional dry patches on my face! I use it on my lips, hands and especially my elbows where I can get awful dry skin. Liked your page on FB as Bex Smith and tweeted about the giveaway. Ooh I have seen so much written about this cream but I'm yet to try it! My skin is pretty hopeless.. so with winter coming I'd use it as an extra moisturiser. Winter & wind = dry, weather-beaten skin for me. Plus I know this stuff is good for redness, which is another of my many skin problems!!! I have liked you on facebook, followed on GFC & tweeted. and on GFC I think it shows me as "zee zee"
GFG is only two of the rs. I used it on the six pack of my many lovers, to keep the shine strong. Also for chapped lips, but mostly the six-pack thing! I have to wash my hands about 30 times a day in hospital, so coming home in evening and nourishing would be amAHzing. If I was lucky enough to win this fabulous cream, I would use it everywhere because it is just so creamy and sorts out all my skins needs. NYC - Cheaper than Chips but just as Tasty! 5 of the Best Lash Batters! Essence Alert! Foiling the Big Boys - Again! Gorgeous to Go - Get on it!